Stories of strange things falling from the sky date back a long time ago. Over the years, there have been many bizarre instances recorded when things have fallen from the skies. Jennings Police Department employee, Eleanor Beal was just crossing the street to go to work when something dropped from the sky. The sky wasn’t falling. She says it was worms, large tangled clumps of them. Beal says, “When I saw that they were crawling, I said, ‘It’s worms! Get out of the way! '” She even called her co-worker outside to prove she wasn’t making it up. Sure enough, she saw worms, and globs of them. Where they came from is a mystery, but some believe that a water spout spotted less than five miles away at that same time near Lacassine Bayou could have something to do with it. A similar event took place in United Kingdom when stunned schoolkids had to run for cover as WORMS rained down on their football pitch. In 2008 a red rain that was certified by a local bacteriologist to be blood fell on a small community of La Sierra, Chocó, Argentina A sample was collected and taken to the nearest town, Bagadó, where it was analyzed. The priest of the hamlet said it should be considered as a sign from God that people must change their sinful ways. On April 6, 2007, a rain of spiders fell from the sky in Salta Province, Argentina. Christian Oneto Gaona and his friends decided to take a trip to Salta Province during their Easter vacation. They started to hike into the San Bernardo Mountain and two hours later, they found the ground around them was blanketed with spiders of many colors, each about four inches across. They found more and more spiders along their way up the mountain. They looked up, and saw numerous spiders falling from the sky. Some spiders started to weave webs as soon as they reached the ground. Weird rains like this has been periodically reported from all over the world. Live frogs, fish and many other more bizarre animals have fallen from the sky here and there. But until this time no one had the chance to take pictures of an on-going weird rain. Christian became probably the first person in the world who caught this weird rain on camera. In 2009, a jelly rain fell in Scotland. Scientists commissioned by National Geographic carried out tests on, but they have so far failed to find any DNA in it. 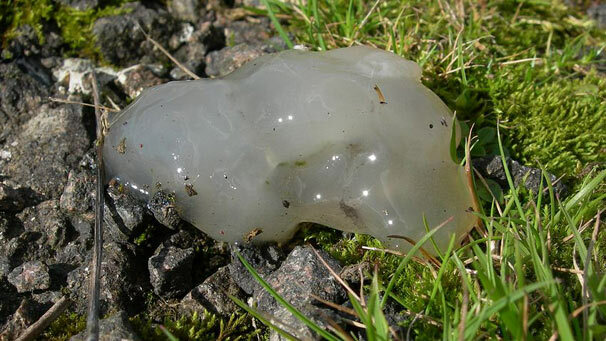 Theories for the origins of “star jelly” abound, one of the most plausible theories is that star jelly is regurgitated frog or toad ovaries, vomited by buzzards or herons as it is indigestible, others refer to the remnants of a meteor shower or even a fungus. This incident reminds of the mysterious jelly spheres which me mentioned earlier. In February 2007, Russian emergency workers flew to a Siberian region where smelly orange, yellow and green snow fell. The Emergency Situations Ministry said officials in the Omsk region, about 1,400 miles east of Moscow, had warned local residents not use the snow for drinking or other purposes, and to keep domestic animals from it. The ministry said the snow, which fell on Wednesday afternoon, was yellow, green and orange and had an oily texture and unpleasant smell.